Enjoy plums in all their glory as their season is still well underway – this Plum Pistachio Ricotta Crostata is just the simple dessert you need to bake this week! Whenever I’m looking for a simple dessert to bake up – whether it’s because I’m craving something sweet or have friends coming over and need a quick sweet treat, crostatas are the number one thing that come to mind. Because of how quickly the dough comes together and how easy it is to find a filling in whatever you have in your pantry and fridge, it’s a quick dessert for those looking to satisfy that need. 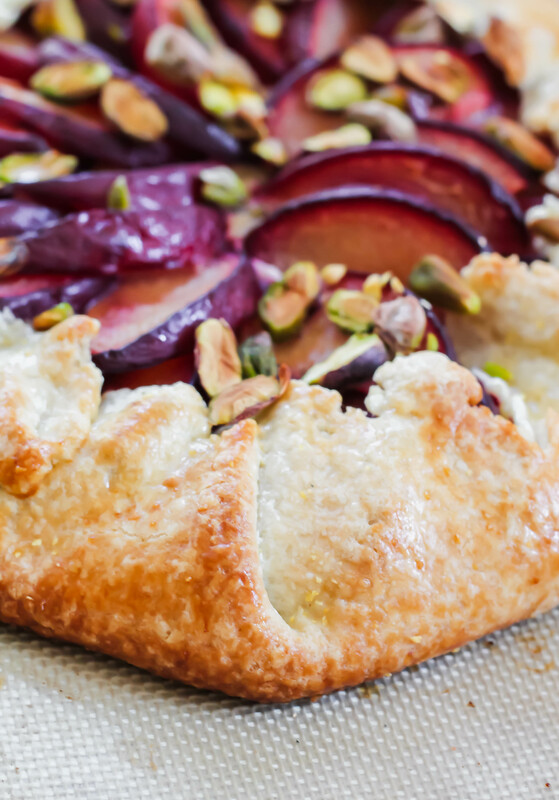 This Plum Pistachio Ricotta Crostata resulted from just that – I had invited a friend over for dinner this summer and wanted to end on a sweet note. I found some overripe plums in the fruit drawer of the refrigerator, a half empty container of ricotta, and a random bag of pistachios deep in my baking cabinet. It’s incredibly easy to make, the dough comes together quickly in the food processor, and you can make the filling with whatever fruit you have laying around. Plums, apricots, apples, pears – pretty much any fruit works! 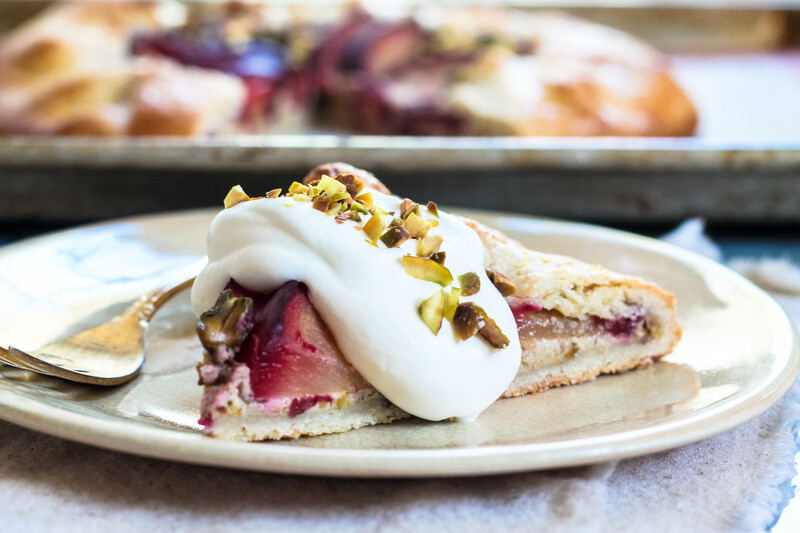 This Plum Pistachio Ricotta Crostata is a quick and easy dessert that when served with a dollop of whipped cream, looks impressive and delicious! To make the dough, plus all the ingredients while drizzling in the ice water, in a food processor until it comes together. Place in bowl and let rest for 15-30 minutes. In the meantime, preheat the oven to 375F and sprinkle a baking tray with cornmeal. In the same food processor, grind the pistachios for the filling and then blend with ricotta and extract to form a nutty paste. Roll out the dough on a floored surface and spread the ricotta/nut paste at the bottom, in a circle about 5 inches wide. 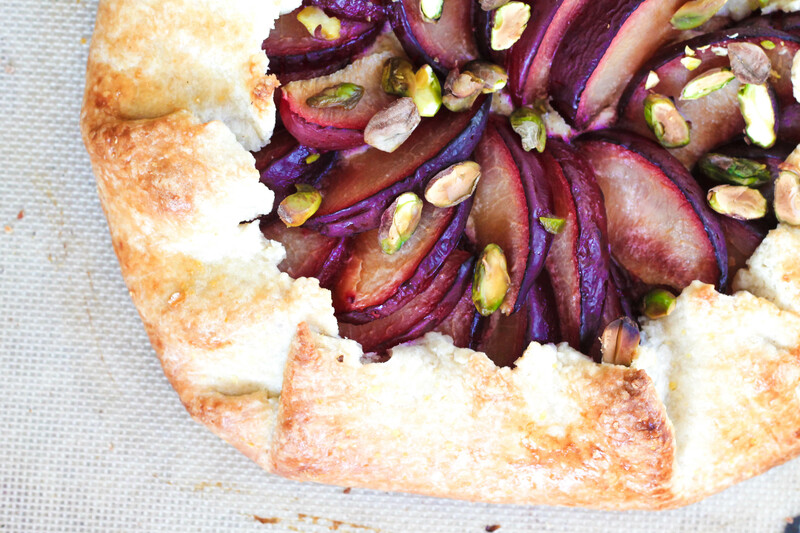 Layer the sliced plums around, tuck the galette over, and sprinkle a few more pistachios on top. Slide on to the baking tray, brush an egg wash over the dough, and bake until golden brown round the edges, about 30 minutes. Serve warm or room temperature with a dollop of whipped cream and crushed pistachios.